Pin it! How to make your own ghee. The first time I heard about ghee was during yoga teacher training when my teacher mentioned going to an Ayurveda institute where he joked that they believed ghee to be the cure for everything and he heard of people drinking a whole bunch of it in the name of health. Anyway, ever since then I've steered clear of it, haunted by images of boiling hot oil being poured down my throat, but in reading the GAPS book to learn more about the diet I'm following to heal my stomach, I realized it had a ton of benefits (though one should probably avoid drinking a ton of it- ha!). So, just so we're all on the same page, ghee is just clarified butter. The cooking process removes the lactose which makes it easily digestible. It's also a great option for a cooking oil because it's got a really high smoke point. 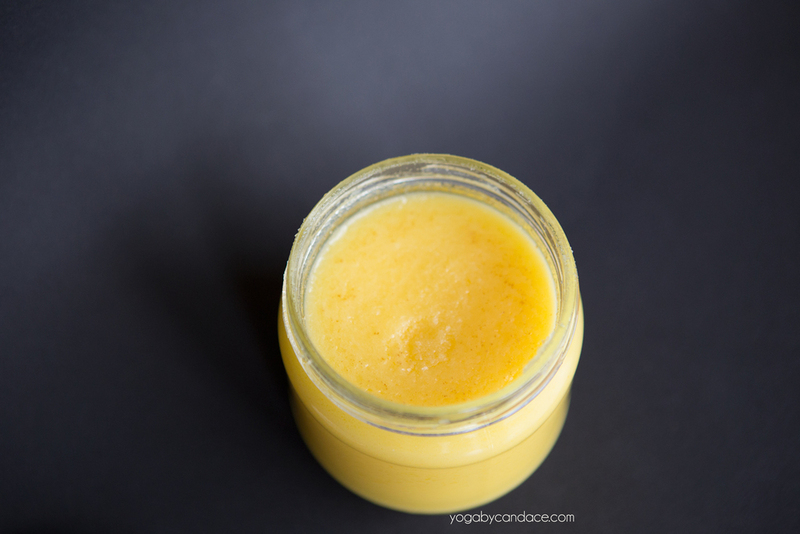 The best part of making your own ghee is that you'll save a bunch of money. On amazon, a 7.8 oz jar of organic ghee is $12.95, and we made 10.14 oz for $6.66. Put the butter in a crockpot. Turn it on high and leave it on for at least four hours (the longer you cook it, the more water and excess junk comes out of it). Note that you can do this on the stove, but be careful not to burn it - if it turns brown or black it's no good. A crusty film will appear toward the end - gently scoop that out with a small strainer. When the cooking process is over (I did it for 4.5 hrs), pour it out through either a nut milk bag or a tight strainer into a jar and let it cool. It'll turn into a solid overnight. No need to refrigerate, but do not double dip - it can easily be contaminated. PS- Don't be scared of fat. Fat doesn't make you fat and saturated fats are good for you.